Electrified Folk-Rock from the great state of Maine. Jake Roche was a guitarist for the popular band Jeremiah Freed as well as the singer/guitarist for the band Lit on the Flash. There are very few remaining copies of "Just Survivin'". If you are interested in ordering a CD, please email me directly at jakeroche@gmail.com. Just Survivin' was recorded, mixed and mastered by Jonathan Wyman at The Halo studio in Westbrook, Maine. Dan Roche - Djembe Drum on "The Shady Tree Waltz"
"There is something going on here not often heard in the folk-rock genre. Electric, swirling guitars and organs, multiple layers of sound. Sometimes a three part vocal harmony, sometimes a lone harmonica. No two songs alike. The auditory equivalent of musical postcards. Things stay interesting. At times it's Donovan meets The Byrds. Other times it's alt-country meets Pink Floyd. Still other times it's The Violent Femmes meets Simon and Garfunkel, and all of this clearly influenced by the Beatles and Bob Dylan. 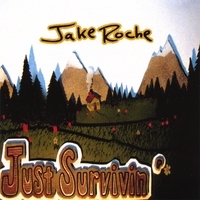 If you are looking for something different in the folk-rock or singer/songwriter category, Jake Roche "Just Survivin'" is a must have."